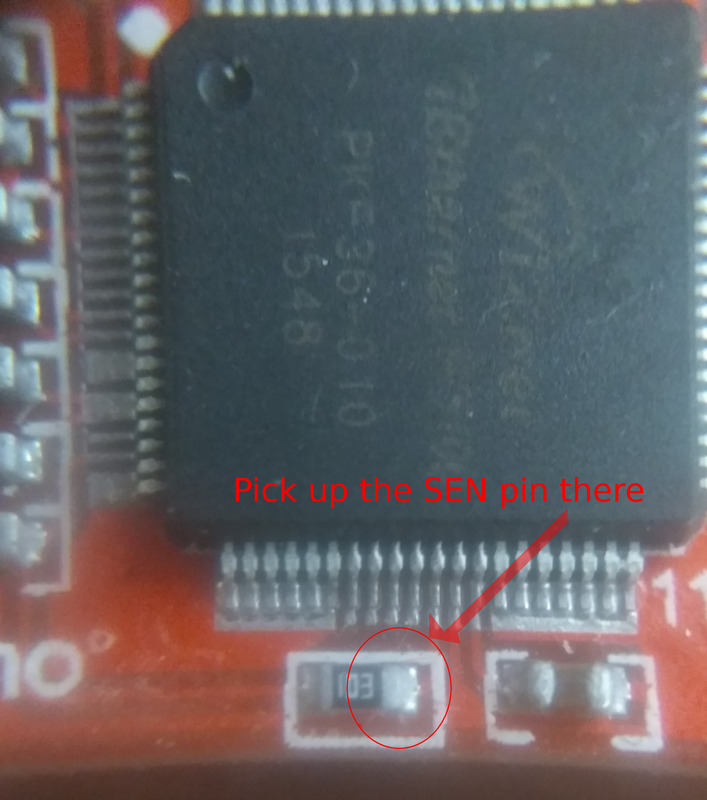 On a recent project in which I shared the SPI bus of a 3V3 8MHz ProMini, with a W5100 Ethernet module and another SPI slave, I experienced some problems: sometimes it would work perfectly, sometimes not. I had hooked up the ethernetmodule with Pin D10 as Chipselect and the other slave (an RFM69) with Pin D8 as Chipselect. Pretty standard and it should work, shouldnt it? Well as it is, it didnt. Oddly enough, I had build it before with another Ethernet module and that worked fine. When I connected my EthernetShield in the same way, the issue was gone. Time to throw suspicion on my Funduino W5100 Ethernetmodule. Well on inspection it is immediately clear that eventhough the functionality is supposed to be the same, the ethernetshield and also my previous module have more chips than my Funduino module. Why for instance does my shield have a 74LVC14 and my Funduino module just the W5100 chip and nothing more? When looking at the circuit of the Ethernetshield it is clear that only one gate of the 74LVC14 (a SchmittTrigger inverter) is used: it takes the SS signal (the ‘chipselect’) inverts that and sends that inverted signal to Pin 31 of the W5100. Pin 31 is the SEN pin. In the Funduino module that was different. The ‘SEN’ pin is just tied high to 3V3 with a 10k resistor. My shield has that pull-up resister as well, but still is controlled by the inverted chipselect signal. Hmm.. that doesnt say much, other than that in my module the SPI mode is enabled, however, judging from the 74LVC14, it seems that this pin needs to be driven to LOW when the Chip is not selected. In other words, it is apparently necessary to disable the SPI mode in order to release the bus to another slave. I used a 74LCV14 (Low Voltage Inverting SchmittTrigger) for my modification, but I am sure an 74LC04 or 74LVT04 (an inverter) would do just as well. 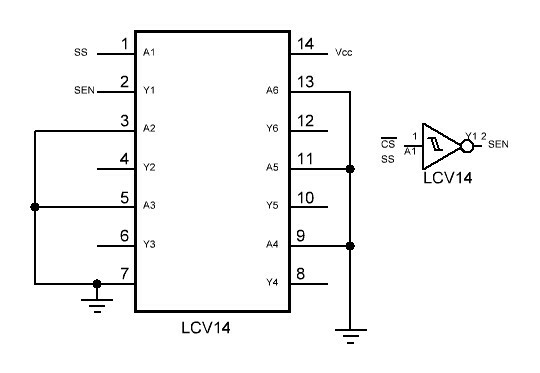 If you vcannot find the 74LCV14, try a 74LVT14 or 74HC(T)14 (it accepts 2 Volt Vcc). John Crouchley who also describes this problem uses a CMOS CD4011. He feeds that from 5Volt, which I did not want to do. It should be posible though, given the fact that the W5100 pins apear to be 5 V tolerant. Perhaps even a simple 1 transistor inverter is possible. Ideal would be an 74AHC1G04 as that is only a single inverter chip that measures only 2x3mm and can easily find a plce on the module. Currently my modification is breadboarded. I will think of a neat solution and then add some more pictures. 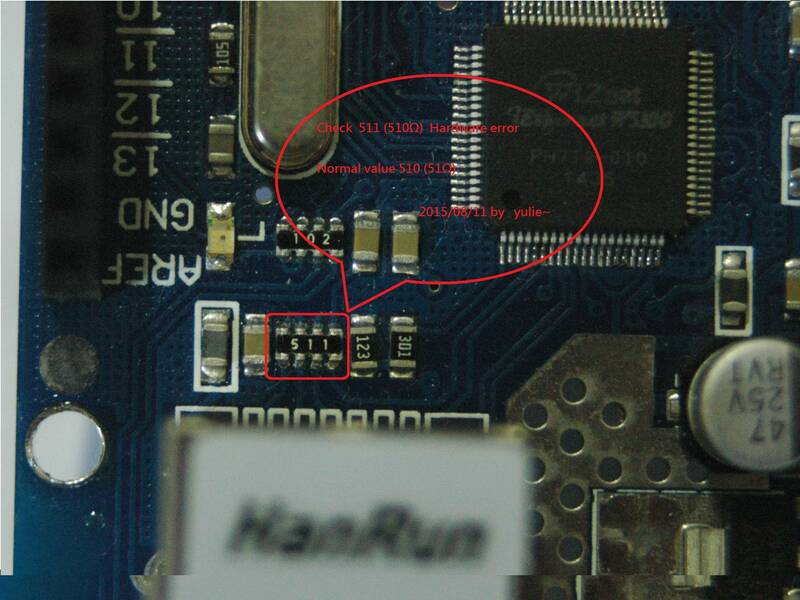 There is another problem with some of the ‘asian webstore’ W5100 based Ethernet shields which isnt really a bug with the W5100 but more a problem with bad sourcing. Some of those shields refuse to make contact with the internet because of some wrong components (resistors) In the picture here of the top of an ethernet shield, directly right of the Ethernet jack there is a “spider” resistor that is labelled with “49R9” that are actually 4 resistors in one package with each a value of 49.9 Ohm. Apparently that was hrd to source at some time and clone manufacturers decided to use 51 Ohm resitors. That is not a problem if indeed they had used 51 Ohm, but by mistake 510 ohm resistors were used (labelled ‘511’). Resistors with a value of 51 ohm should have been labelled with ‘510’. So if you have such a board you need to replace the 510 ohm resistors. If you can’t find the proper replacement resistorpack then apparently it is also OK to solder a 100 ohm resistor between pin 1-2 (Tx+/Tx-) and a 100 ohm resistor between pin 3 and 6 (Rx+/Rx-) as explained here. (So 2×100 Ohm resistors in total). The “Funduino” W5100 module as is a cheap, but qualitatively good W5100 board. However, apart from the ‘problem’ of not being able to share the SPI bus in unmodified state (adressed above), some people have a lot of trouble getting it to work in the first place. The problem is then most likely in the Reset of the module. Modern versions of the Ethernetshield have a seperate Reset controller, that is triggered by the RST of the Arduino. The Funduino Module, just has its RESET tied to 3.3V via a 10 k resistor. As a result the Module’s reset state is a bit unpredictable. Some people get it to work by powering the module up and down a few times, but that remains random luck. What I found that works immediately is to add a slight delay in the setup, before the Ethernet connection is initialized. For me 250mS was enough, but you may need a bit more or a bit less. Also, when you use the shield, the Reset pins of the Arduino and the shield are connected, so the Arduino can reset the shield. With this module you cannot do that: if you would connect both resets, you will notice that you cannot upload sketches. Perhaps it will work if you only connect the RST after you upload a sketch, I did not try that, too much hassle. I found the 250mS delay to work for me. This ‘bug’ does not happen with all Funduino W5100 modules. Supposedly some batches are ‘OK’. There are 2 identification numbers: one on the PCB and one on the RJ45 jack. Supposedly if that says “15/10” it is OK, “14/10” is not. Mine said “16/38” and needed the delay. Thanks, I observed that my Chinese Ethernet board does not work with my normal power saving switch but with a cheap one. My board has the wrong resistor of Bug 2- The ‘510’ bug. Thanks for explanation. Chinese webshops, both a blessing and curse. if your board does not have the inverter, it suffers from the 1st bug. Thanks. Makes sense. Already ordered an inverter. Thanks! 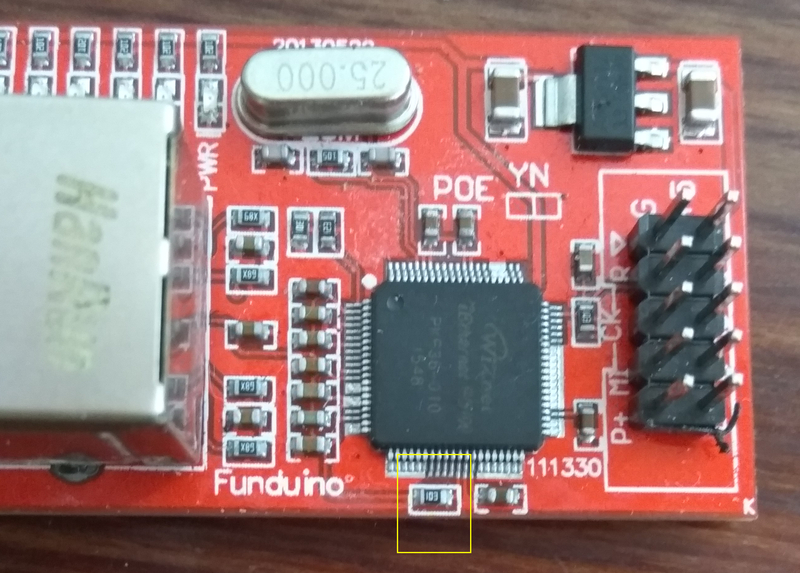 Pingback: Solve problem with “511” at W5100 Ethernet shield – "Arduino tehNiq"